Goyfriend / DruGoy is a fascinating new program presented by the celebrated singer Sasha Lurje (Berlin) and Litvakus – a critically acclaimed klezmer collective founded and led by the ethnomusicologist and clarinetist Zisl Slepovitch (New York). Both Slepovitch and Lurje were naturally drawn to collaborate based on their research and performance of the widely unknown regional styles of Jewish music in Eastern Europe. Goyfriend represents the image of the Jews in the eyes of their Eastern European neighbors with whom they had coexisted for 700 years. The long-obsolete ethnographic material both from century-old and modern collections puts the shared spaces, musics, and languages into the spotlight of the artistically innovative performance. 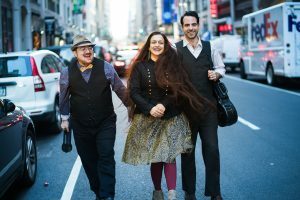 The performance rich in warm, earthy sound taps in repertoires as contrast as high-energy Jewish-themed folk dances, mocking tunes, elements of folk theater, and lyrical ballads telling about the Jewish converts. The songs in the program are sung in Belarusian, Polish, Ukrainian, Latvian — and Yiddish that got well absorbed into all the above. With your help, we are hoping to release this album by mid-2018.